Are you a morning person? Do you rise and shine and jump out of bed? I’m not that cheery, sunny person in the mornings. Nope. Definitely not. Takes a few cups of coffee and a hot shower to even wake me up. And even then it’s usually lunch time when I start thinking about eating. I know. Breakfast is the most important meal of the day, blah blah blah. The only time I find myself eating breakfast is if I have some sort of pastry (yes, donut, hehe) with my coffee. Or a big slice of coffee cake. Or a piece of sweet bread. Carbaholic much? I totally admit my weakness. For some it’s cheese. Others have chocolate cravings. For me…. Today’s recipe is totally easy. And it makes TWO cakes. Which is perfect, because you can stick one in the freezer to serve later. Or share it with a friend who needs cheering up! 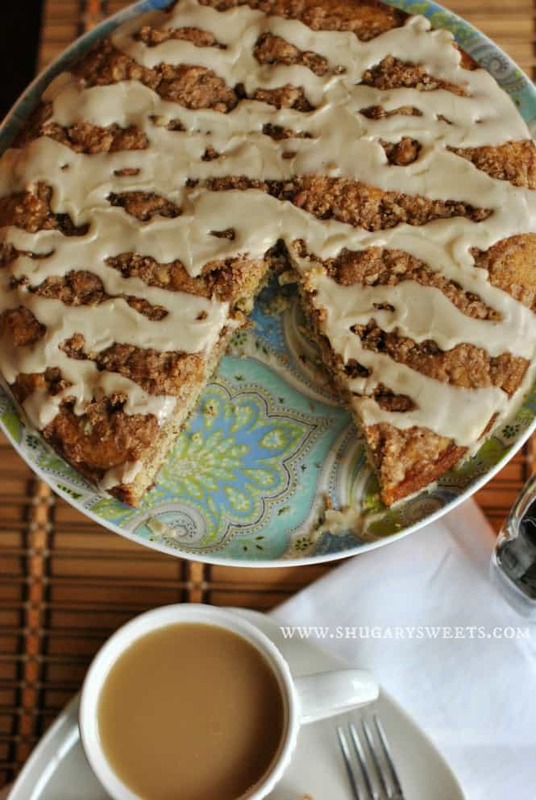 I used my favorite Cinnamon Coffee Cake with cream cheese as my base for this recipe. But I added in blueberries and almonds (because blueberry and almond go together perfectly). I also added almond extract to the cake. The aroma of this cake in the oven is so divine. To freeze the second cake, allow it to cool completely. Once cooled, wrap in aluminum foil and slide into a gallon sized ziploc freezer bag. Label and freeze for later use. Thaw in fridge overnight to serve! ENJOY. To begin making the cake, in a large mixing bowl, beat flour, sugar, baking powder, baking soda, salt and butter together until crumbly. Add eggs, almond extract and milk, beat for about 2 minutes until fluffy and smooth. Pour cake batter evenly into bottoms of two 9inch round cake pans that have been sprayed with non-stick baking spray. Set aside. In a mixing bowl, beat cream cheese with sugar and egg for 3-4 minutes until smooth. Fold in blueberries. Pour evenly into the two cake pans over the cake batter. Set aside. In a bowl, combine brown sugar, sugar and salt. Pour melted butter, flour and almond extract into bowl and combine until crumbly. It will feel like a thick dough. Add in chopped almonds and drop by tablespoon over cream cheese layer. Bake cakes in a 325 degree oven for 45 minutes. Remove from oven and allow to cool about 15 minutes in pan. Remove from pan and cool completely. Slice and enjoy. 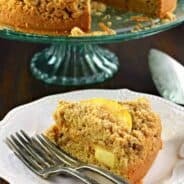 Store remaining coffee cake in airtight container in refrigerator or freeze for later use. 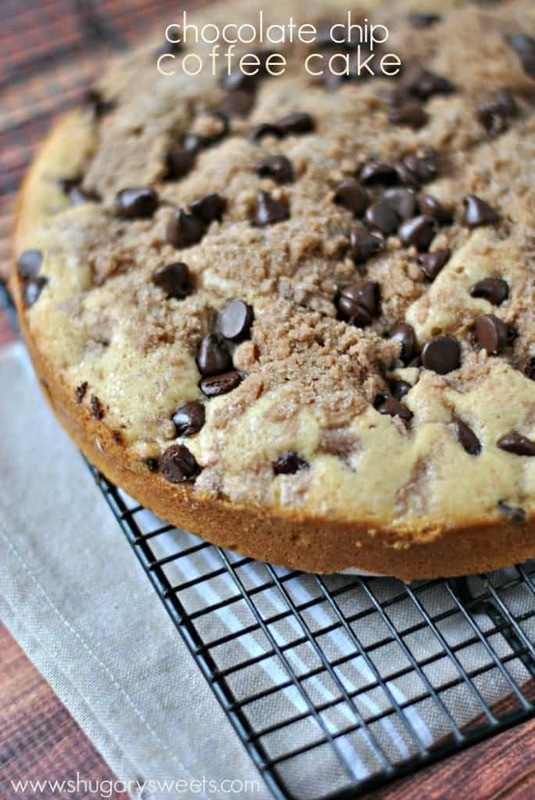 Are you also obsessed with breakfast cakes (aka coffee cakes)? Here are a few of my favorites…. I wish I was having this for breakfast! Pinned! 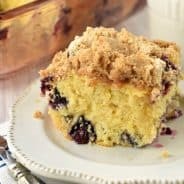 🙂 Love the crumble topping and that layer of cream cheese! Mmm! Thanks for pinning Averie. Yes the crumb topping is to die for!!! Omgggg this sounds delicious. I wish I had a slice for breakfast right now! I love recipes that make two! 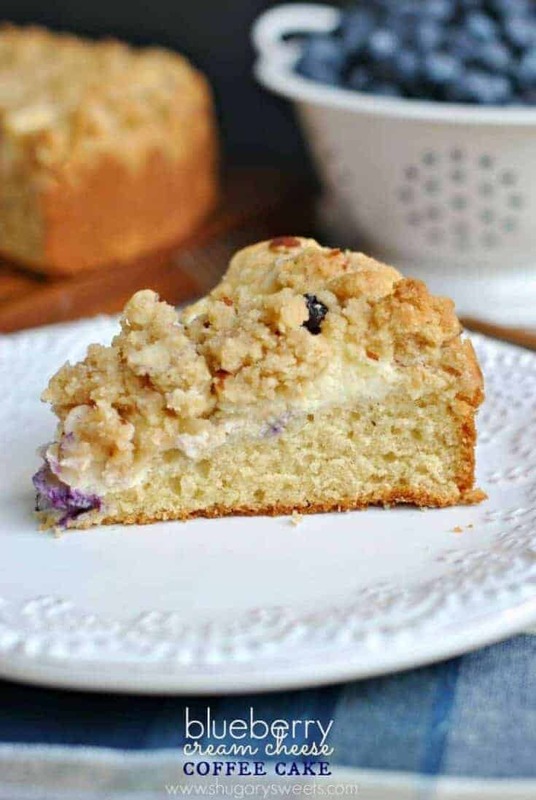 It’s always a surprise when I open the freezer and I’ve forgotten that I have an extra treat in there:) Your coffee cake looks so yummy and I love the cream cheese in the middle; reminds me of a blueberry cream cheese Danish. 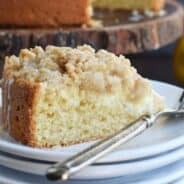 I’m absolutely in love with this coffee cake. It is definitely going in my recipe collection. 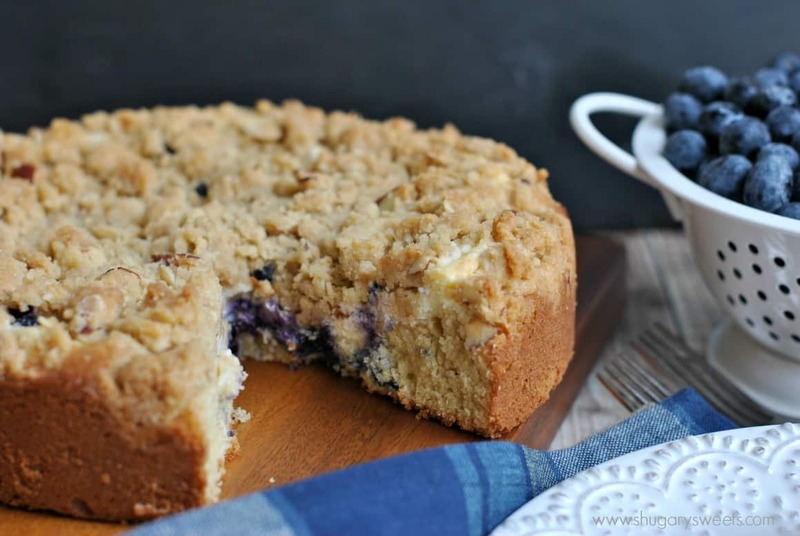 Oh that ribbon of cream cheese and blueberry is irresistible!! What if I crave both chocolate and the crumb cakey breakfast? I’m in trouble, huh? This looks great! The crumb plus the layers underneath…sheer heaven! Looks so light and yummy! Made of two things that I love, blueberries and cream cheese!! Thanks for sharing! 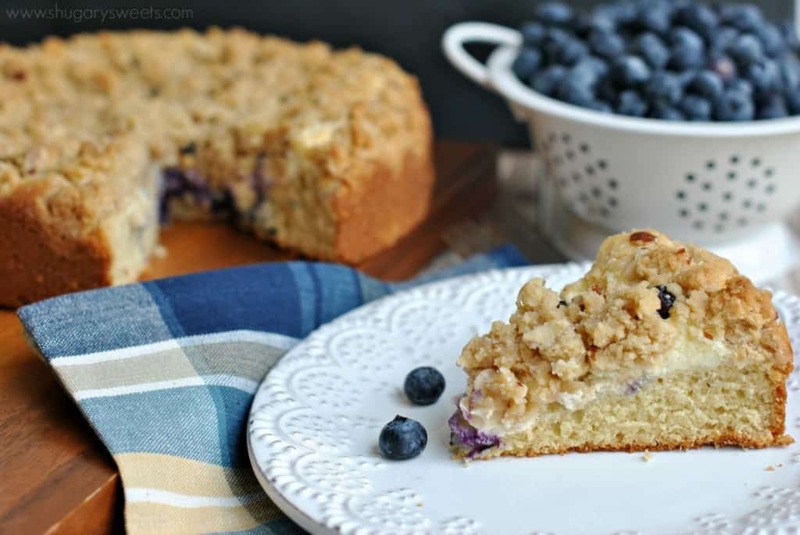 I was going to make a coffee cake for today’s afternoon but after seeing this, I think I have to toss my recipe and make yours! Looks so so good! Pinned! Mornings are not my friend…at all!!! Right now I am drooling over this crazy awesome looking cake and wondering why in the world I am doing another cleanse. Oh yeah, because my sweet tooth has sabotaged my jeans! Nice way to use all the fresh blueberries available now! 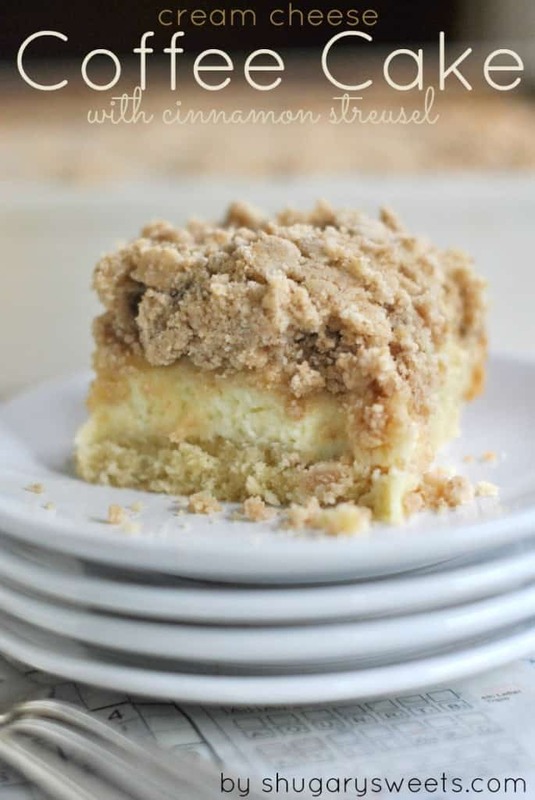 Super mega LOVING the huge ribbon of cream cheese swirled throughout this coffee cake! 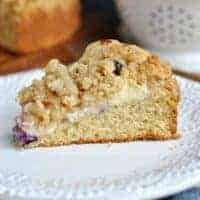 Blueberry coffee cake is awesome, but blueberry coffee cake with a cream cheese swirl is even better!! 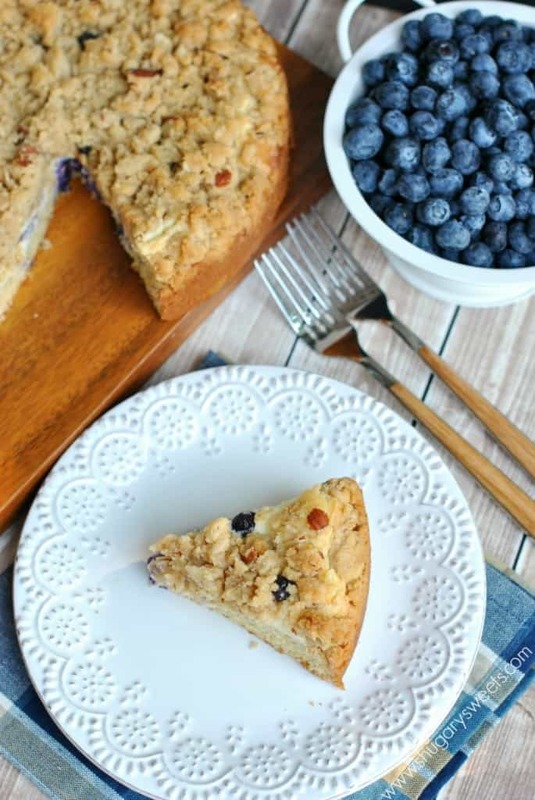 This blueberry coffee cake looks wonderful! This is AMAZING!! Kids and husband literally wait for it to come out of the oven and can’t wait for it to cool to try a piece. Highly recommend this recipe! Easy to make and delicious! So glad you all enjoyed the recipe!! Oh my goodness, I just made this for Father’s Day and it was a huge hit! Yummy! Yummy! Yummy! Will definitely make this one again, thanks so much for sharing! Hey there! I bake at a restaurant in NOLA and I decided to make this yesterday. SO good. I’m thrilled that it turned out well. Thanks! I have followed this recipe step by step. But, you did not say how to remove the cake from the pan with the streusel topping. On my first attempt, the topping started to fall all over so I stopped. However, you did say to remove the cake from the pan to allow it to cool completely.